Sporting battles can often create individual winners amongst the losers. They produce casualties, too. Rory Best watched his side go down in flames, tottering uncertainly on crutches as Ulster stuttered, fatigued and uncertain about their squad depth, to play the Cup rugby required to thieve this famous scalp. The Irish captain has long harboured a send-off in Japan to crown a glorious Irish career; an ankle injury that was serious enough to end his involvement here after just 16 minutes won’t threaten that desire. But it is a reminder of the ever-present reality of frailty that can strike so suddenly. For Dan Leavy, despair succeeded hope, a fatefully mocking cruelty. Leinster are denied their two pre-eminent opensides for the run-in; Ireland may be, too. So much remains uncertain. Even Ross Byrne’s winning kick, nailed with a howl of anguish, seems fitting. This is punk rock rugby; the cramps are all over the stage. Ed Byrne and John Cooney end the game with claret careering from head wounds. There are mental scars, too, which may take time to heal; Jacob Stockdale’s star will still rise in the east but this most public lesson in humility will be a vital lesson. But another sensation sustains us: the joy of a mammoth occasion, with thousands of punters quenching their thirst for raucous fare, denied them in the Six Nations, the mood of all lifted. 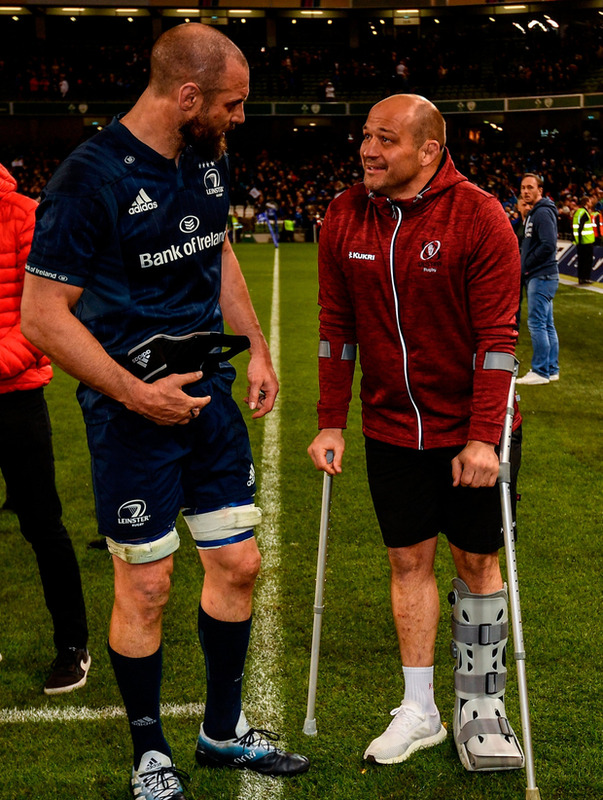 As with Munster’s game in Edinburgh, there was no Six Nations hangover here, players from all sides resuscitated by the return to provincial certainty. Only Sean O’Brien, perhaps, was still wondering how to best recapture his long-lost form; required to do a different shift of work here, he was withdrawn early, as in Rome. Not yet back to his best but the difficulties of team-mates will need to accelerate that process. Or maybe his old colleague, Jordi Murphy, can step up to re-claim his eminence. Ulster coach Dan McFarland knows he’s a World Cup dead cert. “His versatility, he’s not just a 7,” he claims. “He plays 6 and 8. He could play there for us. He offers lineout. Team-mate Cooney has also accelerated his progression since acquiescing in the IRFU’s interprovincial house moves. How to argue that he has not propelled himself ahead of Kieran Marmion and Luke McGrath in the pecking order now? “John is never struggling for confidence,” adds McFarland. “Dwayne (Peel) devised a really good game-plan in terms of the way that we were going to attack them. Can Ireland devise a game-plan, different to their current one, to accommodate him too if required? Ross Byrne, brave and courageous, was axed from the Six Nations but asked questions here in response to the Ireland coach. Or at least demonstrated that an 80 minutes without Jonathan Sexton is not the calamity that everyone in Camp Ireland seems to fear. Sean Cronin has little need to advertise his qualities; perhaps only to Joe Schmidt, who might quibble at two lineout errors. But in open play, he possesses the dynamism Ireland sorely lacked this spring. Some sense his World Cup trip is in peril; a preposterous notion on this evidence. Jordan Larmour didn’t find the dancefloor all the time but did enough jinking to evade the trouble that came his way; it was noticeable he was trusted for 80 minutes here; barely at all in green. And then there are the unlikely lads: Dave Kearney, resourceful after all his injury woes, two crucial tackles in either half, one preventing a try, one setting up the final, surging siege on the Ulster line. And what of Luke Marshall, the forgotten man of Irish rugby? Absent for ten months, yet within ten minutes offering Ulster belief that they could do the unthinkable? “The World Cup isn’t really on my mind,” he says. A reminder that not everyone can reach the promised land. But, after a spring of green gloom, hopeful home thoughts lead one to ponder that the next trip for abroad might not be filled with the trepidation we once feared.